These are SO GOOD! I’m on a very restricted diet right now and these tostones made my week. I made them exactly as suggested and they turned out perfectly. Thank you! These were fabulous! We ate some with guacamole, and we sprinkled mozzarella cheese on others and added a sauteed shrimp. Craving tostines. I wonder how these would come out in the air fryer. These were amazing! I used the bottom of a flat plate to smash them and it worked great (and I to sprayed the plate with oil to prevent sticking). I made one batch seasoned with just salt and then a second batch with tahine – delicious! This recipe is definitely a keeper! Thank you! This was my first time trying plantains, and I’ve always been put off because most other recipes call for deep frying, which I do not like because it’s messy and wastes lots of oil. I tried this today using one plantain (I am guessing the ones in the USA are super-sized compared to the ones in the UK) and it was just nice for me. I will definitely be making these again. I love these so much! 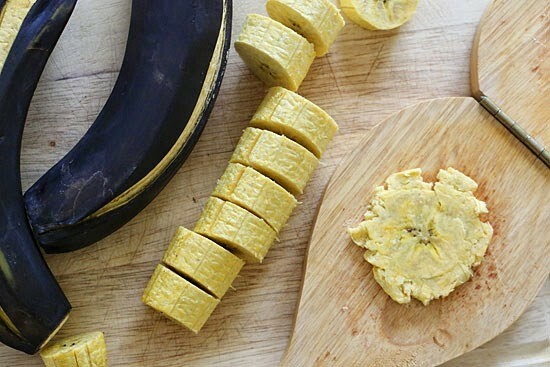 My husband wanted to try plantains and I knew where to go for the recipe! We devoured these with your garlic mojo dipping sauce. I could probably eat the entire pan myself! Thanks for this recipe! Just made these for lunch. 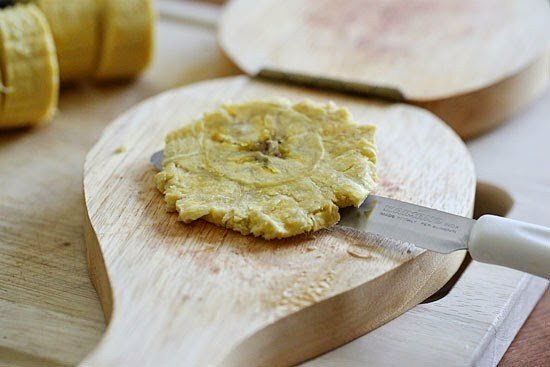 When I lived in Costa Rica I ate fried patacones all the time- this takes the fatty greasy frying process (which I love, don’t get me wrong) and makes it so simple and clean and a bit healthier too! I loved it! Seasoned mine with salt, pepper and garlic, and served with guac. Absolutely perfect. Takes me back to my days on the beach! Are these still salty or do they turn a bit sweet? Not sure, this is replacing frying that is usually done twice. I don’t know if I did something wrong, but mine got all dry and cracked. Microwaving them seemed to harden them a lot. I took them out right after the peels turned black. I put a good portion of them in the oven, but ended up frying the majority. The ones that were in the oven were gross and hard and I had to throw them out. I might not have put enough oil. Any insight? This recipe worked great. The Potato setting on our microwave works great for plátanos. 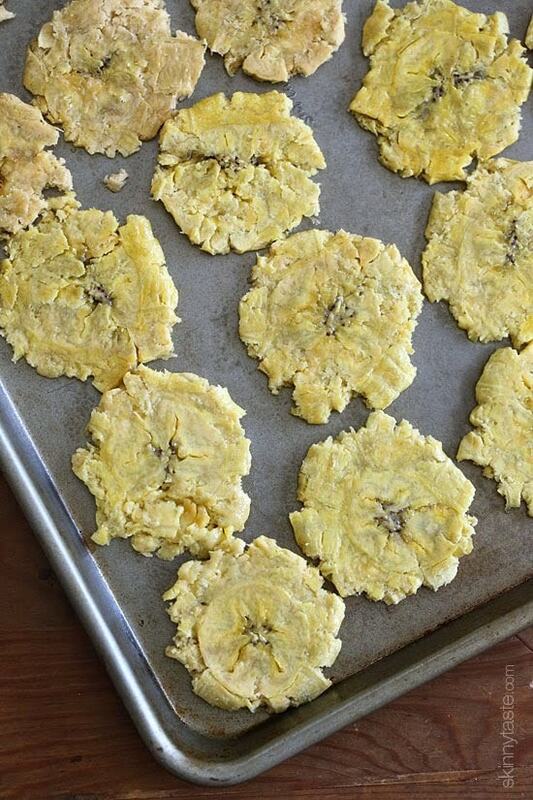 Make sure to salt your tostones aggressively after the 2nd bake. I like the idea of the microwave for the first part but for the refry I’m going to use my air fryer,i it works for everything else. Just made these according to your directions for use in tacacho and my very picky family loved it!! Way healthier. We’re all overweight and have a family history of diabetes, so all of us are looking for ways to cut calories. While I still wouldn’t consider tacacho as a health food, this version saved us a lot of calories, fats and cholesterol. Thanks!! What can I use in place of the cilantro? Can you cook them & then freeze them at some point for future use, also can you use them to make Mofongo? I do make Mofongo with this recipe. After cooking them as above, I put some salt and smash some garlic in the pilon. Put the tostones in the pilon and start smashing them adding some no fat chicken broth for mostiture. A great alternative since I’m on Weight Watchers. About 9 smartpoints for one plantain. By the way, I use my Nuwave oven to bake the tostones.. The traditional Puertorrican dip is a mix of equal amount of ketchup and mayo with minced garlic. I just made these and they turned out great, nicely browned and crisp but much healthier! I love tostones. I just made these and they were absolutely fabulous. Not exactly the same thing as fried, but crispy and delicious in their own right. Healthier and a lot easier to clean up the kitchen. I will prepare these often. Thank you for posting this recipe. I like this idea. It's sort of like that "crash hot potato" recipe but with plantains. Can't wait to try it! I brought in a green plaintain with me to work today for lunch. After I am half way into my commute, I realize that I did not bring any spray oil nor a tostonera. I know I can use a plate but do you think I can make this w/o the cooking spray? Point of interest, deep frying in HOT oil is actual healthier than shallow frying. 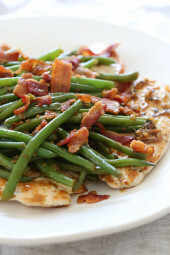 The high temps sear the food thereby preventing the fat from soaking into the food. my husband was from puerto rico and he smashed them between a folded brown paper bag using his hand or rolling pin . the bag absorbs the fat and they do not stick . 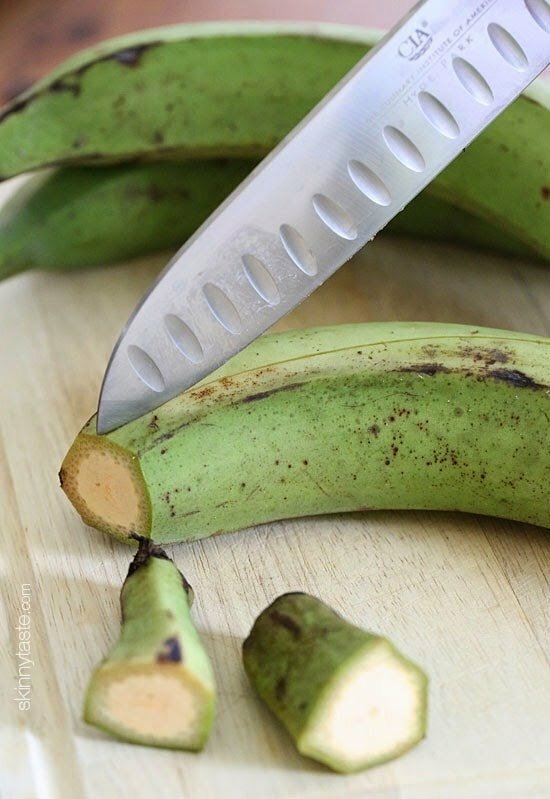 he also made me a wooden like paddle two pieces with a hinge between so it could be used to smash them but i like the paper bag better as it is just then thrown away no need to wash it ..
You can most definitely eat ripe plantains raw – just like a banana. 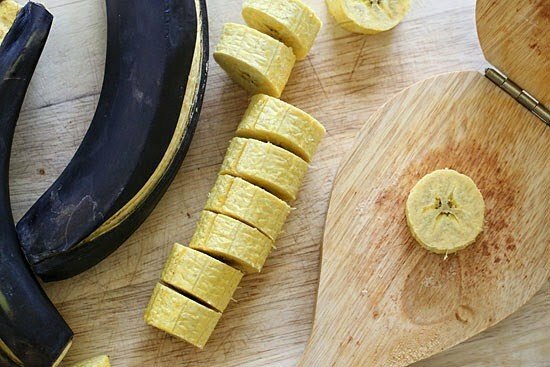 And yes, you can use firm – not ripe bananas in this way too. I love the various ways that you can use both fruits green and ripe. 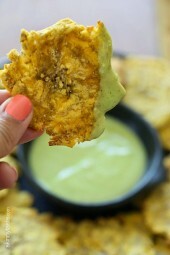 I tried these and they were fenomenal, I am Cuban and we eat "tostones" all the time. Its great to be able to make them a liter version! I have had a recipe on my to-do list for awhile that involves plantains, making plantain chips out of them but have yet to find any plantains. Oddly enough I did find plantain chips the other day! But now I must find real plantains for this. I tried this for the first time yesterday. This may be a very silly question – but I had difficulty smashing them. I tried a glass jar and a glass and the plantains kept sticking to the glass and crumbling. Did I perhaps microwave too long or not enough? I'd like to try this again. hi , i only fry them until soft in olive oil or bacon grease, not much .take them out and put them inbetween brown paper bag and smash with your hand or rolling pin. they will be hot , then re fry them again until light brown and crispy . good with ketchup , spanish rice and beans, and yuca with olive oil . yuca is like a potato boil until soft, split remove the string from middle and enjoy with olive oil pepper and salt . If they are crumbling, it means they are undercooked. They should be soft enough to smash without a lot of resistance, but firm enough to form a small disc. i like to double fry them in a little bacon grease and then a little salt , i smash them in a folded brown paper bag with my hand . 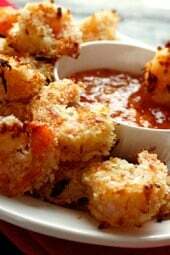 works all the time , they are good with dipping them in catsup also .. Being Latina & used to eat this fry, just the thought of putting the plantains in the microwave doesn't sounds right! Is it healthy? For sure it is more work! I don't know if I'll try this way, or maybe just for curiosity of knowing if it taste the same or even close! 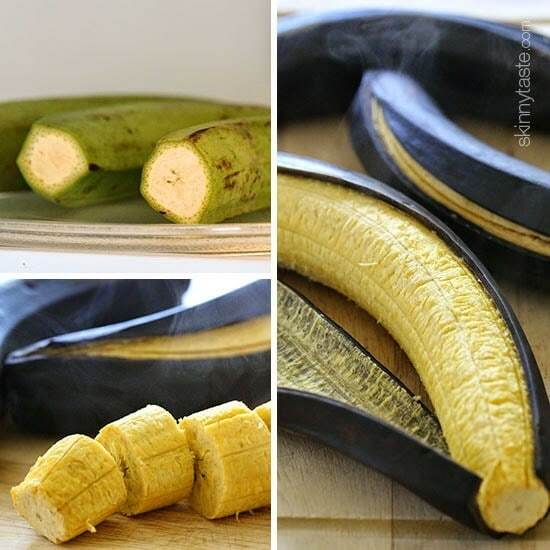 Can we prepare the same with ordinary banana? I don't think so, plantains are firmer and need to be cooked. Yes they can be done with ordinary green bananas. I've made them and they taste great. no not ordinary banana has to be green plantains my hubby was from puerto rico and that is the way they do them . other wise they don't taste right . Shouldn't you include the oil in the ingredient and nutrition info? What kind of oil do you use? Canola cooking spray, and yes I did include it, although it will greatly depend on how much you use. I counted 5 seconds worth. Where do you buy your plantains? At the grocery store? Thanks !! Hey Gina– Why are these 4 points+ if they're just fruit+salt? Shouldn't they be 0? I was about to ask the same thing since bananas are 0 pts now. Ask your leader, if I use the WW recipe builder it's not 0. I think they only count it as 0 if it's a snack, eaten alone. It is amazing that banana could be used to make so many delicious food. These look and sound delicious – yum! Hey Gina! These look great! I had a question about your new cookbook. Does it include pictures like all of your great recipes online? Thank you for the info. These look so good. I don't have a microwave, how do you recommend I cook the plantains before baking them? Use my old recipe, the link is above. It's all in the oven. MMM! I need to try this microwave trick. I bake them often, and I like them, but I want to try this new trick. Thanks for sharing!!! If you don't have a smashed would the back of a large knife work? 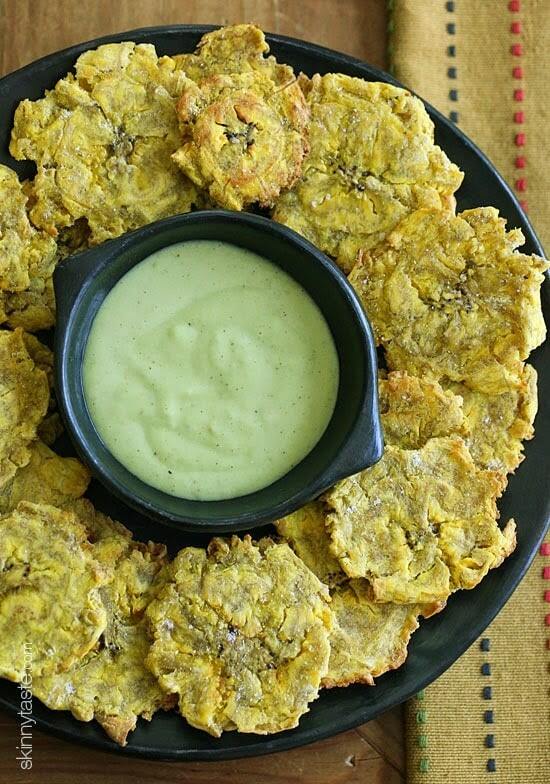 I have had tostones and LOVE them!!! Hooray for a healthy option! Anything flat to smash them would work! I have a tostonera, but when I didn't I smushed them between two saucers. My family is from Haiti and we eat plantains every which way. But this way is my favorite. I was so happy to find this recipe! I've never tried to stones because I never want to deep fry anything but these look amazing! I don't have a microwave, so do you think I can bake them till the skins are black? 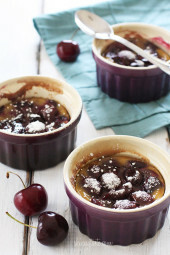 I linked to my old recipe above, you can make them in the oven, but nit in the skins. See recipe linked in the story above. Gina could you use these to make Mofongo? Would it be a good idea to use parchment on the pans? I would do it without parchment, you want them to brown. I was thinking of bringing these to work for a snack. But you said to eat them right away….so, would this be a bad idea? You need to eat them right away, and they don't taste good reheated. Can I freeze them and eat later? What is the dipping sauce you are using for these baked plantains? It looks delicious! Zesty avocado cilantro dressing, the link is above. Never had these, but definitely going to try! Thanks, the dip is perfect! You can also use guacamole as a dip. Just made the Zest Avocado Cilantro Dressing for the crockpot taco chicken salad recipe and it is OUT OF THIS WORLD good! I have shared it with everyone and no one can get enough!